In ungreased large roasting pan, melt butter in oven. Stir in tequila, seasoned salt, red pepper and dry margarita mix. Stir in cereals, nuts and pretzels until evenly coated. Bake 1 hour, stirring every 15 minutes. Stir in cranberries. Spread on paper towels to cool, about 15 minutes. Store in airtight container. Use 2 tablespoons lime juice for the tequila for a family-favorite snack mix. 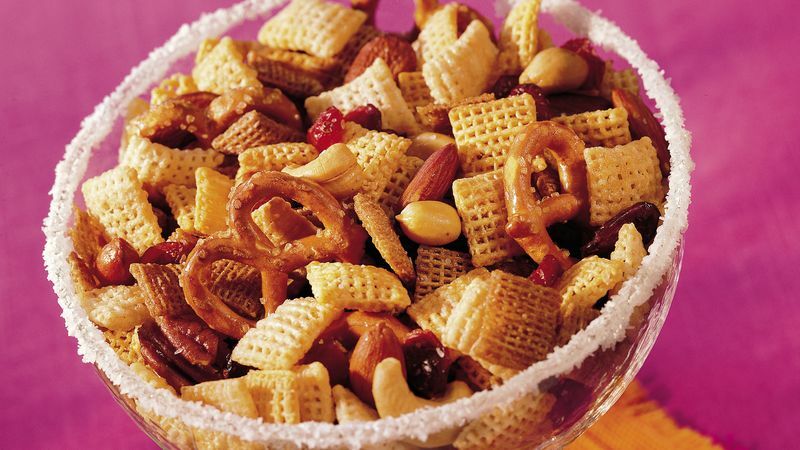 Serve this zesty snack mix in a margarita glass with a salted rim. Rub the rim of the glass with the cut side of a lime or lemon wedge, then dip the rim into a shallow dish of coarse salt. You can use 9 cups of Corn Chex or Rice Chex instead of a combination of the three cereals.